West Terrace Park (also known as Case Park) is one of Kansas City’s most under-appreciated and underutilized green spaces, with a scenic landscape and stone ramparts framing stunning panoramic views of the West Bottoms, Missouri River, and beyond. While well-used and well-loved by some, the park is too often overlooked by Downtown residents, employees, and Parks and Recreation maintenance staff. For several years, Downtown stakeholders including the Downtown Neighborhood Association, Kansas City Design Center, Downtown Rotary, Kansas City River Club, HNTB, and DST have supported efforts to enhance the park. While West Terrace Park has a number of infrastructure and programming needs, one of the few proposed improvements to gain traction is an off-leash dog park at the north end of the park, on the sloping hillside below the Lewis and Clark statue. The off-leash dog park concept fits well with ongoing Parks and Recreation Department initiatives, serves a neighborhood need, and provides an opportunity to attract park users and increase overall activity and visibility in the area. 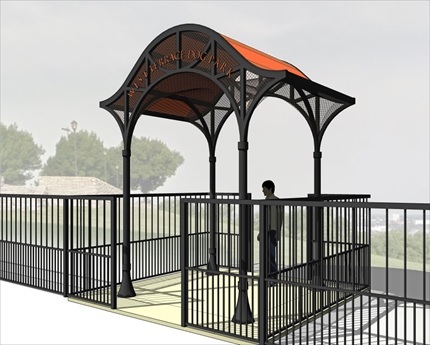 It has taken several years of funding requests through the City’s Public Improvements Advisory Committee (PIAC) process and Greater Downtown Area Plan (GDAP) Implementation Committee, but the City finally now has the funds to design and construct the new dog park. And what a dog park it is! Preliminary designs for the park were presented to the Downtown Council last month, where Parks and Recreation staff and project designer BBN Architects Inc. explained that because of the high profile location of the park and support of private partners, an elevated quality of design is being pursued for this location. 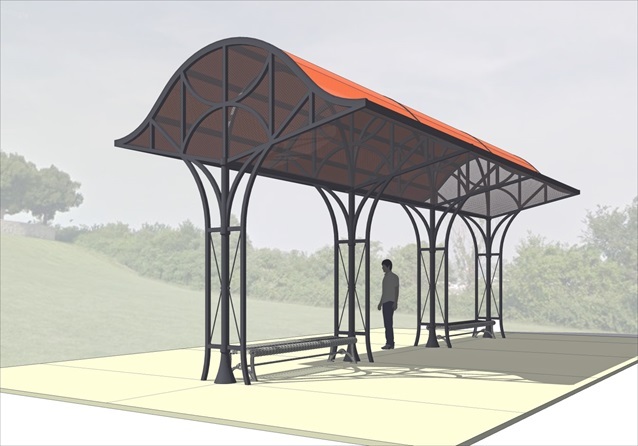 The focal point of the park is a new canopy shelter that pays homage to the train platforms of the historic Union Depot that was formerly located nearby in the West Bottoms. 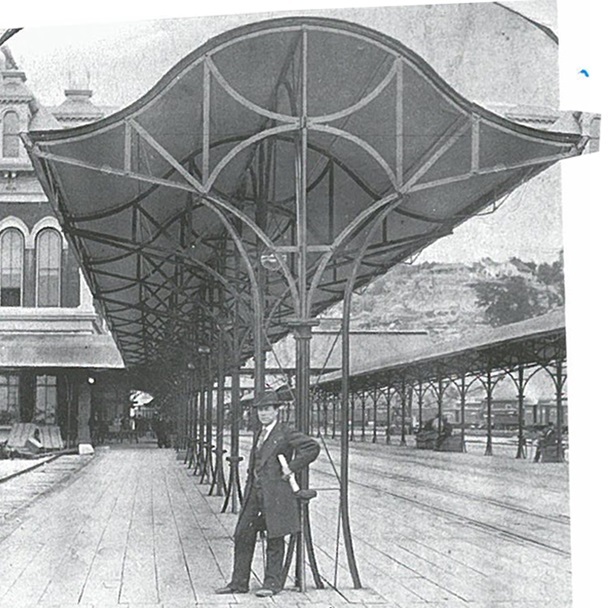 The Union Depot in the West Bottoms was the inspiration for the new shelter design. A meandering path, grand stone staircase, and new trees will further enhance the space. 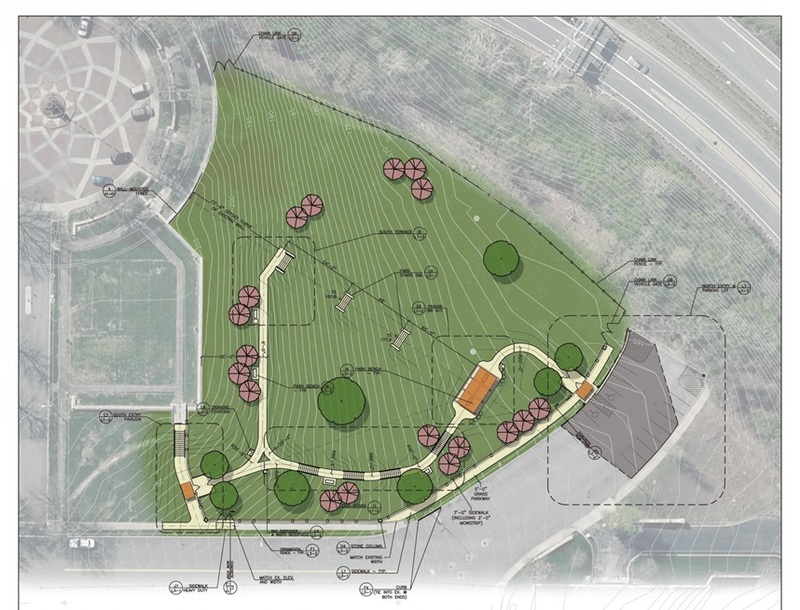 The proposed dog park design includes a meandering path, a stone staircase, new trees, and a decorative shelter. Image courtesy of BBN Architects Inc. and Kansas City Parks and Recreation. A decorative metal fence will enclose the park. Here we see one of the entrances and decorative fencing for the new dog park. Image courtesy of BBN Architects Inc. and Kansas City Parks and Recreation. In the past, we at Urban Angle openly wondered how a dog park could possibly take multiple years to fund and construct, but the proposed design brings some clarity to this question. The Parks and Recreation Department has taken this project much further than the simple fence that was originally envisioned, and decided to apply the lessons of the nearby Penn Valley Dog Park to create a model facility in this location. Curiously, these luxurious new accommodations may be reserved for dogs and their owners only. Parks and Recreation is currently exploring options for maintenance and operations of the dog park. One of the options includes requiring registration with the City in order to access the park, both to fund the additional maintenance (here, maintenance means picking up poop), and to create some accountability for users. Restricted hours of operation are also being explored, which raises much broader questions about the purpose, use, and successful programming of the City’s public spaces, particularly given that vehicular access to the adjacent Lewis and Clark statue has also been restricted recently. No decisions have been made yet regarding operations, and the Parks and Recreation Department is seeking input. In interesting contrast to the high design, heavy infrastructure, and laborious public funding of the West Terrace dog park, an effort to fund another off-leash dog park is underway roughly one mile to the east. 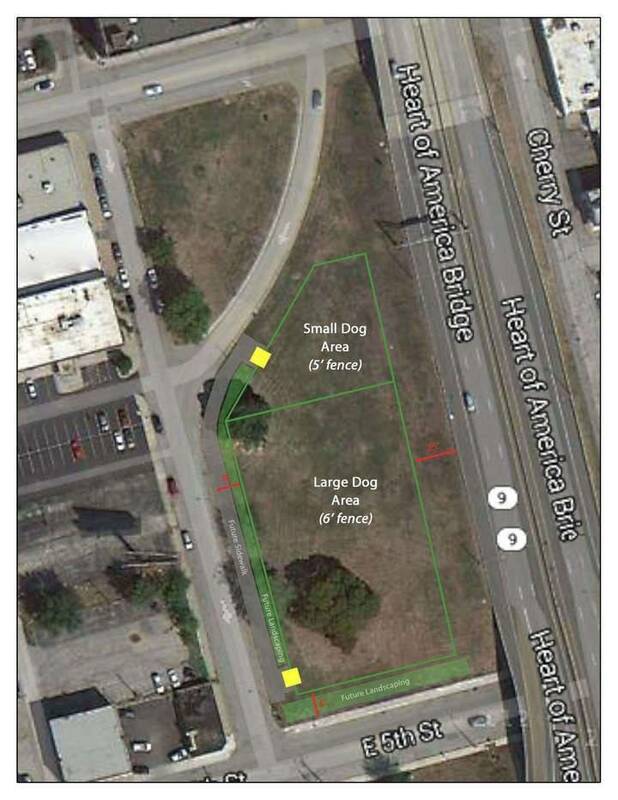 Already used as a de facto off-leash area, this stretch of MoDOT right-of-way lot beneath a busy highway between the River Market and Columbus Park is the target of a grassroots crowdfunding campaign to install a simple fence and landscaping. This site in the right-of-way for Highway 9 is the target of a grassroots crowdfunding campaign to construct another off-leash dog park. This community-driven effort still has a lot of ground to cover to meet its funding goal, but if successful could help to inform a more timely and responsive model for neighborhood improvements. You can check out the campaign here. FYI- your first setence is factually wrong. Thanks for the background. Everyone in the neighborhood calls it Case Park. That’s all I was trying to convey. This is much needed. Don’t have a dog and live inside the loop, but I donated to the River Market one! I’m so excited for this fancy new dog park! We’ll go all the time! I would be interested to see a post on principles that lead to successful dog parks, and the benefits dog parks bring to urban areas (to counter the obvious argument that dogs trample grass and poop everywhere). I will have to confess that I don’t know much at all about what makes a successful dog park. Do you? Would like to do a guest blog about it? Any new news on this yet, of when construction might start? I live in this area and would love a place close by to go to with my pup. The Case Park project appeared to be fully funded several times, but the City’s Parks Department is asking for additional funding again. I’m not sure why it is taking so long or costing so much, but the crowdfunded dog park in the River Market is newly opened and people are using it.